An adventure series where you have to control a pool of water (named "Eddy" in the second game) by tilting the world around it. 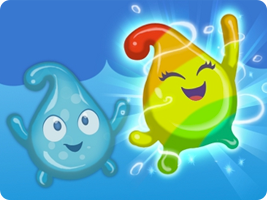 Use the liquid mechanics and shift between ice and water vapour forms to solve puzzles and advance through the world. Be sure to keep your shape as you take on the shadowy creatures that have taken over the world.